There’s something about being a mom that has made me fall in love with cute snacks for kids. No, it doesn’t matter that my son isn’t old enough to eat any of them, well except the Boonanas. If it’s cute, and edible, I want to make it. Last week I was laying in bed trying to fall back to sleep after a midnight nursing session. But I couldn’t, because I kept imagining an edible Christmas wreath made from a bagel. So on Sunday, I gathered some ingredients, and went to work. The first attempt failed so miserably, I didn’t even take a picture for you to laugh at. Sorry. Then I remembered the big box of baby spinach in the fridge, and knew I’d found the perfect edible “holly leaf”. The holly leaf cookie cutter I used comes from this set of mini cookie cutters. Those are my most used cookie cutters, because I love making tiny gingerbread cookies with them every year. I didn’t have a tiny round cookie cutter, so I used a frosting tip. I plan on investing in this set of round cookie cutters though. The frosting tip works, but didn’t give the cleanest edge because it’s not actually designed for cutting. This is a pretty healthy kid’s snack or easy breakfast for Christmas. It’s also quite affordable, using just half a bagel per serving. The recipe also uses a small enough amount of the red bell pepper that you can use the rest of it in any recipe that calls for a whole red bell pepper (how about this amazing vegan corn and bell pepper soup?). If you need to make the snack dairy free, and can do goat’s milk, just substitute chèvre for the cream cheese. We won’t be having this for Christmas breakfast, because our traditional breakfast is spam, eggs, and rice, but I think it might be the perfect snack before visiting Grammie’s house the next day. Do you have a traditional Christmas breakfast? I’d love to hear it in the comments below! 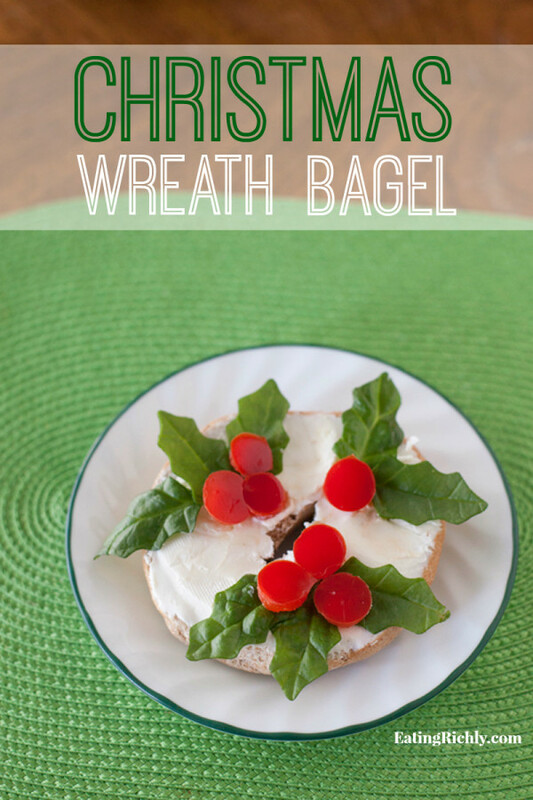 This edible Christmas wreath bagel makes a cute snack for kids during the holidays. 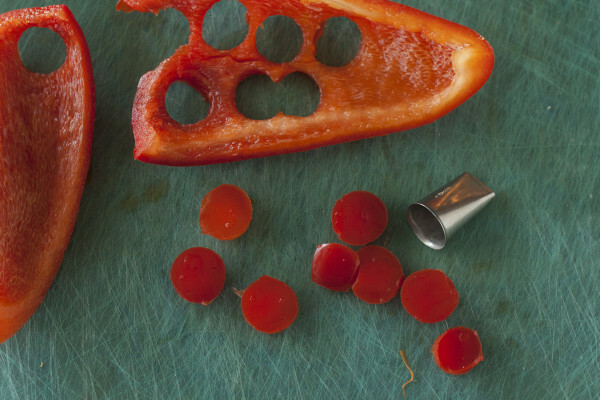 Use a small circular cookie cutter to cut out seven holly berries from the red bell pepper. 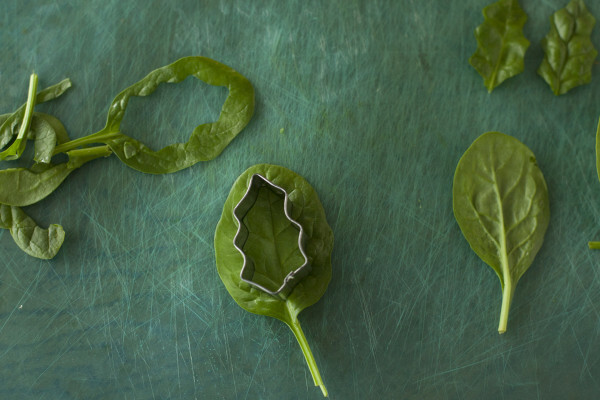 Use a small holly leaf cookie cutter to cut out seven leaves from the baby spinach. 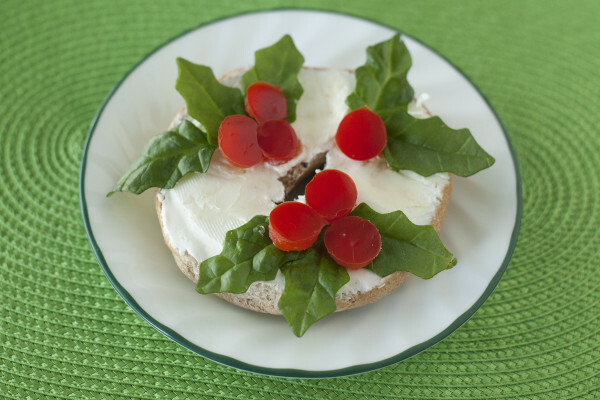 Spread the bagel with cream cheese and arrange the leaves and berries as shown in the photo. Approximate cost/serving: This only cost about 30 cents. Vegetarian/Gluten Free: This is vegetarian and can easily be made vegan with a cream cheese substitute. For gluten free, use gluten free bagels. Very cute. Did your family do your gingerbread houses this year?